The unique moon lamp is equipped with a touch-sensitive smart sensor, giving you convenient light and brightness mode control. Simply tap the power button and quickly adjust brightness and color to your liking. 2 brightness levels from dim to bright. Match your mood and applied to any occasion you want. simplicity and flexibility.Easily charged from computer power bank or mobile phone. 【DIMMABLE COLOR CHANGING TOUCH CONTROL】 Two brightness levels settings of dim to bright, Perfect night light,white and yellow lighting color to match your mood or any occasion. you can switch freedom by the Touch Button at the bottom, comfortable glow to any room. 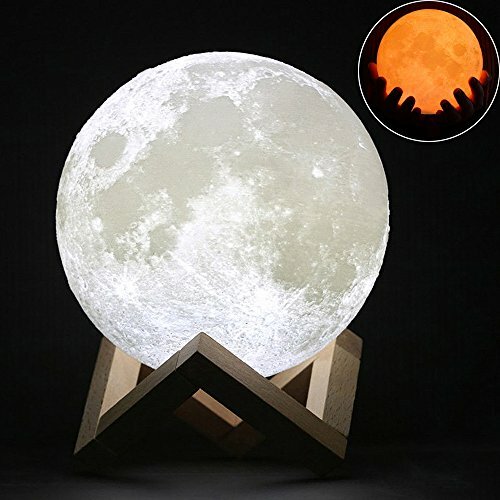 【SUITABLE FOR MANY OCCASIONS】 The brilliant 3D moon led light design brings you mystery and romance, suitable for many occasions, ideal creative decorations for courtyard, dinner table, pathways, parties, cafe and can create a wonderful atmosphere that beyond your expectations. Best gift for everyone. 【HIGH-QUALITY MATERIALS】 Our moon lamp night light is using the environment friendly material---PLA, is a new type of bio- based and biodegradable material, making from renewable plant resources such as corn. 【100% SATISFACTION GUARANTEE】 we combine the latest technologies to design and build solid, reliable gadgets to our valued customers! 100% Satisfaction guarantee and reliable customer service within a 24 hour time support, 30 day back money guarantee - 12 month warranty. If you have any questions about this product by Wpky, contact us by completing and submitting the form below. If you are looking for a specif part number, please include it with your message.